Ride the Sugar Train with Gossip Bingo | Play now! All aboard! Hop on the Sugar Train and satisfy all your cravings. This mouthwatering game is full of cupcakes, lollipops, chocolate blocks and more! Get your sweet tooth ready! Take a ride on the Sugar Train at and see where you arrive. There are big jackpot prizes to be grabbed as you ride the super cute train and watch the reels spin towards victory. Bet across 25 pay lines and see if you can activate the thrilling bonus round where the cash stakes are even higher. 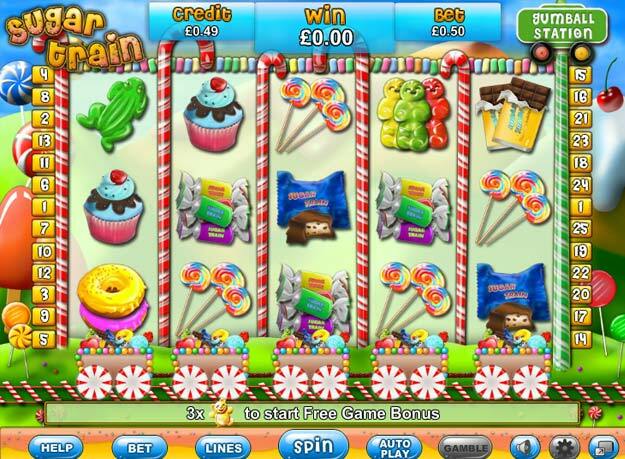 Enjoy super sweet fun with Sugar Train Slots and take your chance to grab the jackpot cash as you go.